Ok, I really had to be motivated to talk about this since it's really something tricky to fully understand..I don't even know if I understood all of it yet. I'll try to do as simple as possible to explain how on-campus accommodation works at NUS (National University of Singapore). First, NUS is not providing accommodation on-campus to every students since about 50,000 students are studying at NUS. Basically on-campus accommodation is divided between PGPR (Prince George's Park Residence) which has the biggest capacity by far with about 2800 students and Halls (further informations here). Halls are reserved to mostly (all?) full-time undergraduate students. By the way if you didn't know it, if you're doing an exchange at NUS for a period of 1 or 2 semesters you're considered as a Non-Graduating student and therefore are at the lowest priority of the accommodation policy. Second, since rooms in Halls are accorded in priority to freshmen, undergraduates students have to reach a certain number of points by doing co-curricular activities (check Sarah's website) in order to get a room of campus. It really seems crazy but this is how it works.. 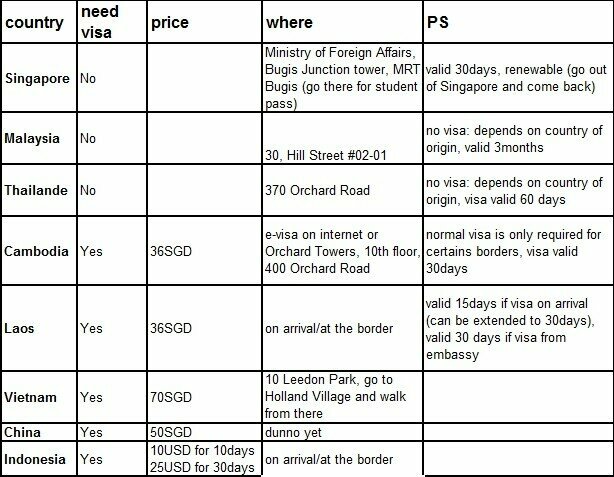 So my first advice will be to apply for a room at PGPR if you are planning to do an exchange at NUS next year. My second advice will be to not apply for a type A room since there are very few type A room at PGPR. Let's me explain what is the difference between type A, type B and type C room first. Just for info, my actual accommodation off-campus at Boon Lay is among the cheapest you can get in Singapore. I'm paying S$400 per month (S$1,600 for a semester stay) for a non-AC, double-shared (two rooms per flat, two persons per room) flat which is located 1 hour from NUS by public buses and 1hour from the city center by MRT (Singapore's metro). Free shuttle buses are also available and free wi-fi access (rather slow) is provided in every room. This accommodation off-campus is also provided by NUS: visit Yoha:Hostel. Most people I know are paying between S$500 and S$1,000 per month for their accommodation. So like I said second advice: apply for a type B room and then a type C room and finally accommodation at Yoha. Then if you really want to try to get a type A room it's up to you. Final advice and most important one: if you don't get any accommodation, call OSA (office of Student of Affairs) to complain, send an email to a person in charge at OSA, even better do both. Do it before your arrival, do it upon your arrival. You really have to bug them as much as possible and please don't be afraid of doing it. For the semester 1 stay, I thought that I shouldn't complain about accommation since they found me something at Yoha but I should have complain. This is how it works here, I discovered it at the beginning of this semester when I learnt that people that really bug them a lot finally had a room at PGPR. I even had the confirmation of this "method" for next semester since 1 day ago I first received a negative answer for semester 2 on-campus accommodation. What did I do? I complained of course, I sent them back an email 30min after having received their negative answer. I went to OSA's office this morning to complain. Friends of mine did the same and finally this afternoon they accorded us on-campus accommodation at PGPR. I just received an email from the Residential Services saying that I have not been accorded any accommodation on campus for next semester. I am really unpleased to learn this decision since I was expected to get, finally, an accommodation on campus. It's the second time that I'm beeing refused an accommodation on-campus and I'm starting to wonder why. Both times I was among the first persons to apply, both times I said I didn't mind to get an accommodation in a type C room in PGP or in a Hall (any Hall you can find). And yet it's once again a negative answer. So I am really wondering why some people can get an accommodation on campus and not me. I am sure you will simply answer me that you are already welcoming many students on campus and therefore you can not satisfy everybody's wishes. But, because there is a but, last semester you told me and many other people that there were not any left accommodation on-campus and yet 2months later you organized a waiting list for it and found something for dozens of people if not more. Maybe it was stupid or rather naive, but I thought that because I already did a semester in Boon Lay with all the problems of delays, off-campus life, additionnal costs it means and all the time we have been complaining about the shuttle buses and the internet access to finally get something a few weeks before the end of the term (like the fact that the new internet access is currently being installed) I would have had more chances to get an accommodation on-campus for the 2nd semester than someone already there. I appreciate the information about alternative housing but I won't have time to look it since I have to prepare 5 final exams and won't be in Singapore between the 9th of December and the 13th of January. Therefore I'll really appreciate if you could reconsider your decision and accord me an accommodation on-campus wherever you can find one. I really don't mind about having a room in a Hall even though the rooms are not as nice as the ones in PGP, even though Halls are mostly occupied by non-European, non-American people. faut tenter ça chance avec type A, vu comme c'est possible de négocier, si t'obtiens rien tu peux toujours négocier un type C à la fin. Bon courage à tous! talking about big wait times for the free buses, and slow internet access... Have these problems been remedied? I'm also wondering about the demographics of the hostel. All international students? Whats the average age? I'm 27, and Im not sure I want to move in with a group of 18 year olds. Anyway, I hope you can let me know! Thanks for your time, and maybe see you in Singapore.